Was this really just four years ago? So much has changed — besides Ryan’s hair. Schools were closed here Thursday and Friday for fall break. Unlike some past years, we didn’t have any elaborate plans. Veronica took off work on Thursday and I took off Friday and we mostly spent time together, at home. It wasn’t until the weekend was almost over the that I began to wonder why we hadn’t done something more organized. That got me thinking. 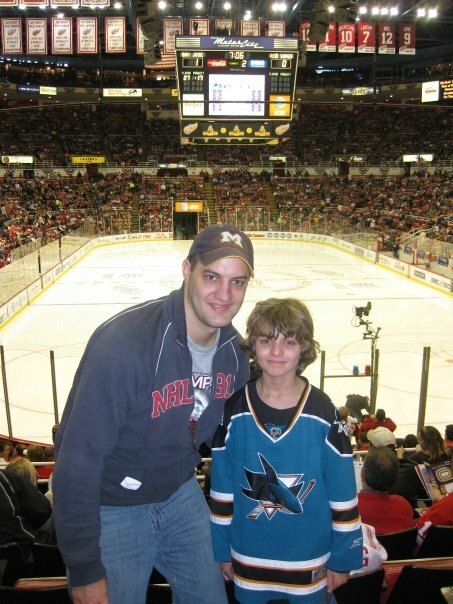 It was just four years ago that Ryan and I used this weekend for our original grand adventure, traveling to Michigan to see the Sharks play the Red Wings as well as a Michigan football game. A year later we did another hockey trip, this one to Philadelphia and Boston. When I think back on those trips, the overwhelming reaction I have is a realization of just how different a child Ryan is today than he was then. Those trips were carefully planned to avoid disruption as much as possible. For each, Ryan packed a backpack full of comforts from home, and the only issue I recall having was when we realized I forgot to pack the flashlight he likes to use as a “spotlight” to shine on the players who score in his Hockey Guys games. We took two road trips this fall with barely a thought. We didn’t worry about Ryan not getting to bed at his exact normal time. Yes, we packed the white noise machine and the weighted blanket and cans of the juice he loves. The difference is we probably would have been fine without them this time. We did not pack the Hockey Guys. Wow, was 2009 really just four years ago? Everything seemed so different then. Because it was — Ryan was in second grade then, sixth grade now. He would be an entirely different person no matter what his situation, but for me the differences are punctuated by just how much progress he has made. It is a challenge to prevent my mind from thinking ahead four years and trying to figure out what our lives will be like. It’s hard, but I will not let my mind go there. Thinking too far ahead with any child can be perilous, but we have particularly tried to avoid it with Ryan. Mostly because it’s a pointless exercise, but also because the outlook was too cloudy. This time, I won’t allow my mind to go there because I want to enjoy the present. The brief exercise in thinking of the distant future serves one purpose, however: It reminds me to cherish the present. If the last four years can slip by as fast as these seemingly have, the next four can do the same. We didn’t do much this fall break, but we were together, and we enjoyed each other’s company. Nothing wrong with that. Nothing at all — except that it was over too soon.